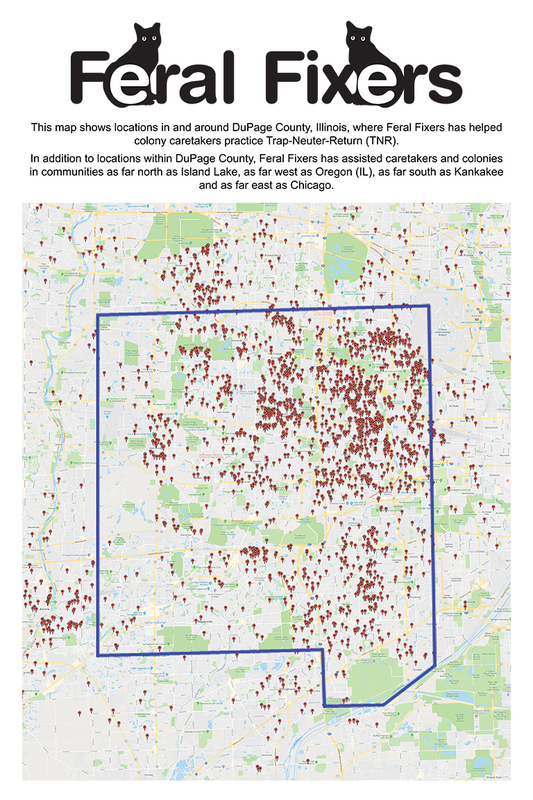 Feral Fixers concentrates its efforts in DuPage County, Illinois, but will help people in their TNR efforts outside of DuPage County if the situation is appropriate. The indicator icons on the map point to all of the locations in and around DuPage County that Feral Fixers has helped since its inception. The blue border shows the approximate boundaries of DuPage County. This map is current as of December 31, 2018. There are 2,308 unique locations indicated representing a total of 10,971 cats that Feral Fixers has had spay/neutered as of that date. Some of these locations may represent large (15-20 and up) colonies while others may represent only one or two cats. Click on the map thumbnail to see a larger version of the map.